"Chocolate and lamb in chili? Of Course!!! 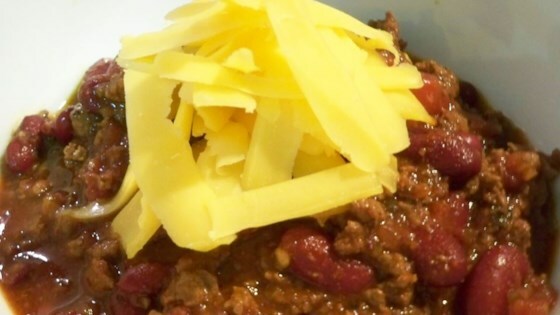 This is a wonderful chili recipe, concocted by my son Bryan. We use Icelandic lamb because it is really lean. Lean lamb is a must." In a large pot, cook onions and ground lamb in olive oil over medium heat. When onions are soft and meat browned, season with red pepper flakes, basil, cumin, cinnamon, garlic, chili powder, dried oregano, cocoa powder, sugar, and bay leaf, and salt and pepper to taste. Cook for 1 or 2 minutes. Stir in tomatoes and beans. Increase heat to bring soup to a boil. Reduce heat, and simmer for 15 minutes. Your new favorite white chili! Very tasty, and of course even better the next day. This was a good chili with nice heat and the chocolate adds a richness to the dish. We made this as written and really liked it. Worked well in the slow cooker!